To view this video, visit https://youtu.be/ytAdcXM2oyo. You've probably heard that you need to think critically in all of your classes, but what is critical thinking? 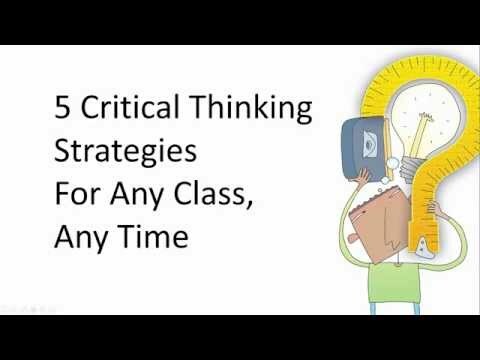 Watch the video to learn 5 strategies for critical thinking and a fun way to use them in any class. Your Turn Try paper ball analysis. Crumple a piece of paper into a ball, and on five relatively flat spots, write 1, 2, 3, 4, and 5. Roll the paper ball. Match the number on top to one of the critical thinking strategies. Then write a paragraph using the strategy to explore a topic you are studying. Compare two things (show similarities). Contrast two things (show differences). Analyze a topic (break into its parts). Categorize something (tell what type it is). Evaluate something (explain its value or worth). Your Turn Do a round-robin paper ball analysis. Roll the paper ball. Match the number to a thinking strategy. Then use the strategy to say something aloud about a topic you are studying. Pass the ball to the person on your right and repeat the process. See how long you can keep the analysis going. Using 5 Critical Thinking Strategies by Thoughtful Learning is licensed under a Creative Commons Attribution-NonCommercial-ShareAlike 4.0 International License. Based on a work at k12.thoughtfullearning.com/minilesson/using-5-critical-thinking-strategies.